Breakfast in our home is a bit of a ritual. We are a porridge family, particularly during the winter. 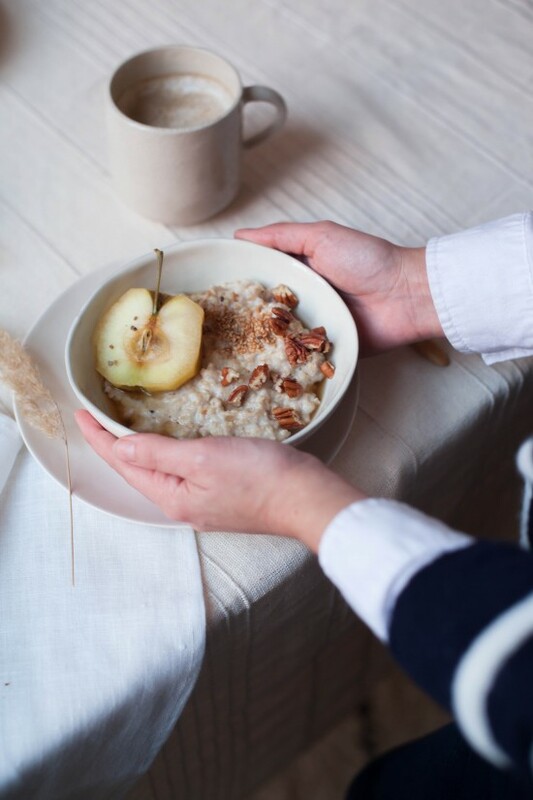 My more spontaneous self likes to mix it up a bit in the warmer months with eggs, fruit and cereals but I can’t deny it, a bowl of warm oats is worth waking up for. Which is just as well for my routine-loving husband who is usually on breakfast duty while I make the beds and get Lola ready for school, because it means he doesn’t have to think too hard about what to make each morning. 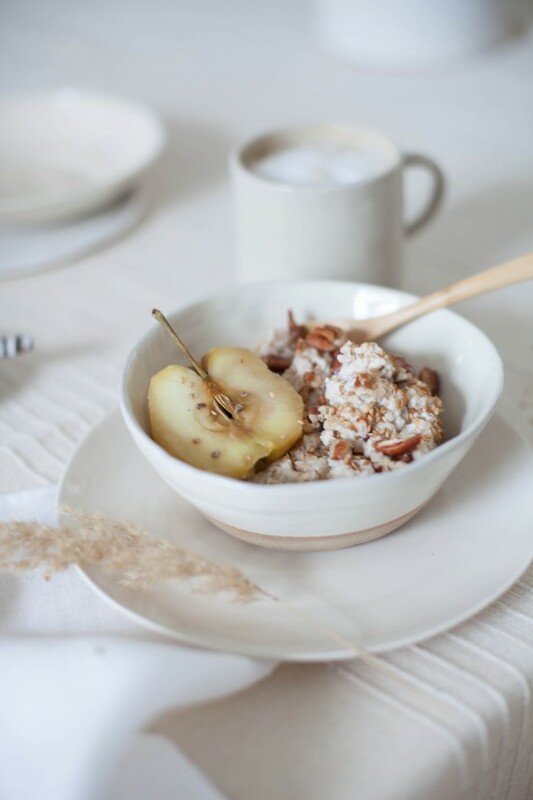 But that doesn’t mean I don’t get bored with the banana or pear porridge varieties we usually eat, so this creamy coconut and cardamom oats recipe created by Ajda Mehmet is a welcome diversion to our standard morning ritual while easy enough to slap up sleepy-eyed first thing in the morning, and is just so delicious! If you asked me my favourite flavour I would say it is coconut. No matter how exciting and pretty all the flavours in the ice-cream window look, I always order coconut without fail. Usually combined with something else (I’m a two-scoops girl) but always coconut first. So when Ajda and I were playing around with ways to flavour these oats and she casually dropped coconut into the conversation, I got so excited because I knew this was a porridge I could get behind, and on a daily basis too! 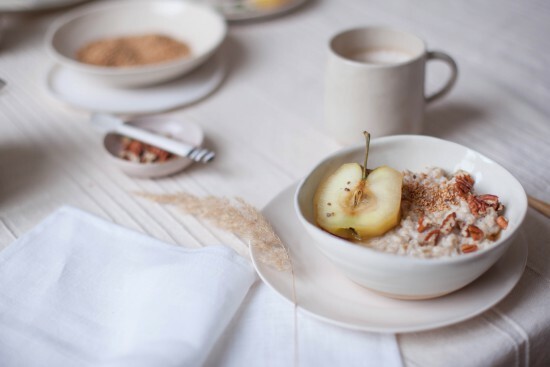 Enter sweet stewed apples, roasted sesame seeds and aromatic cardamom and these creamy oats will having you returning to the pan for seconds! Bring the water, crushed cardamom pods and maple syrup to boil in a small pan. Peel and core the apples and add them in. Once the water is boiling, reduce the heat slightly and let the apples simmer for about 20 mins, until tender all the way through. Leave to cool until the porridge is ready. 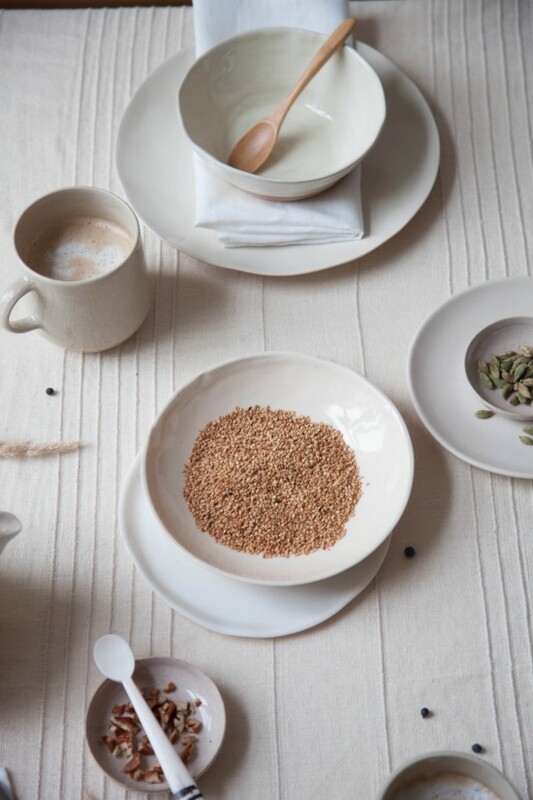 While the apples are simmering, roast the sesame seeds on a dry, hot pan until golden. To make the porridge simply add the oats, coconut milk, water and spices to a pan and allow it to heat slowly for 10 minutes, stirring continuously. 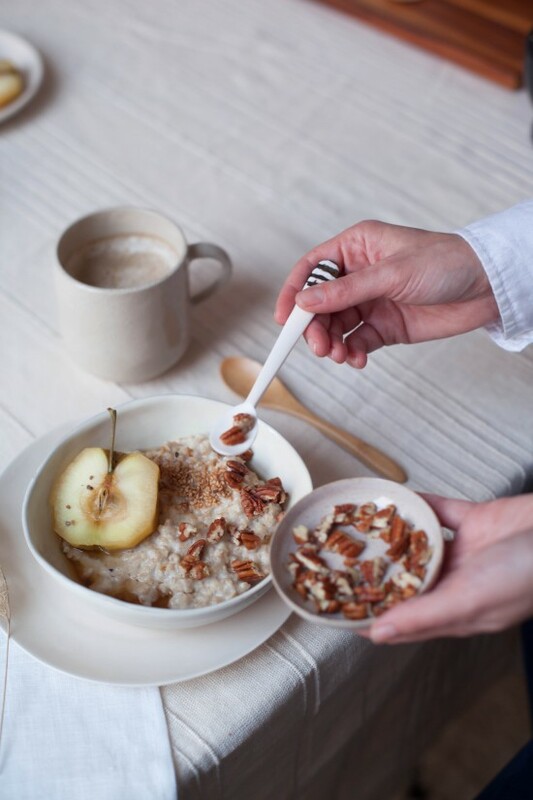 Serve the porridge in small bowls with half a poached apple and a fresh drizzle of maple syrup to taste. Sprinkle with toasted sesame seeds and enjoy. 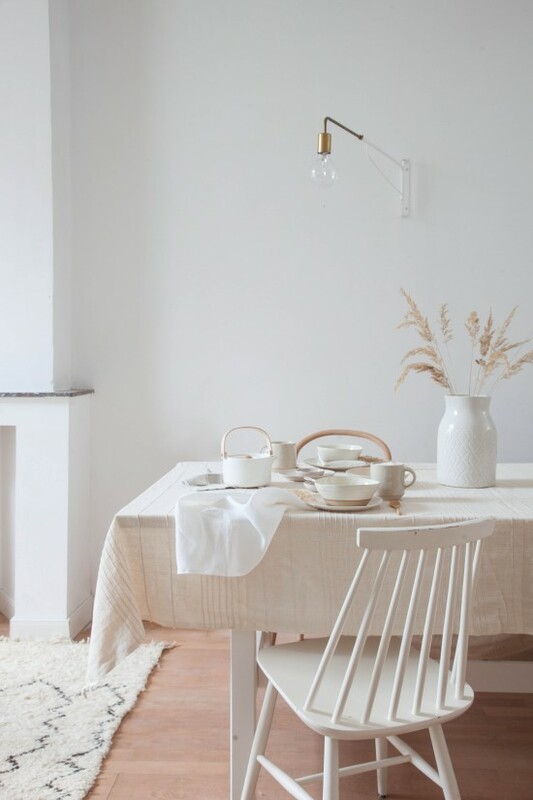 I am generally not one to set the table for breakfast. I do however set the dinner table each night and meticulously make my bed each day so I don’t know why I never go the extra mile in the morning. 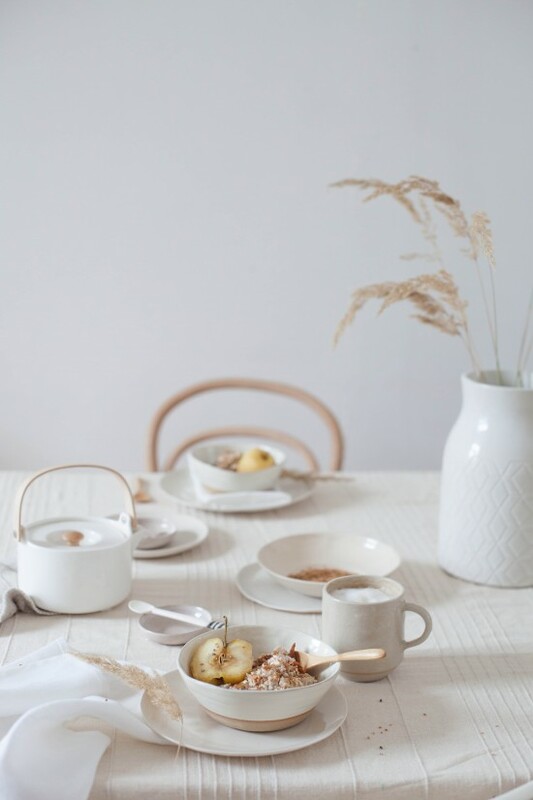 What a lovely way to start the day though, with a simple but inviting table (that doesn’t have to take long to set), and a thoughtfully prepared breakfast. 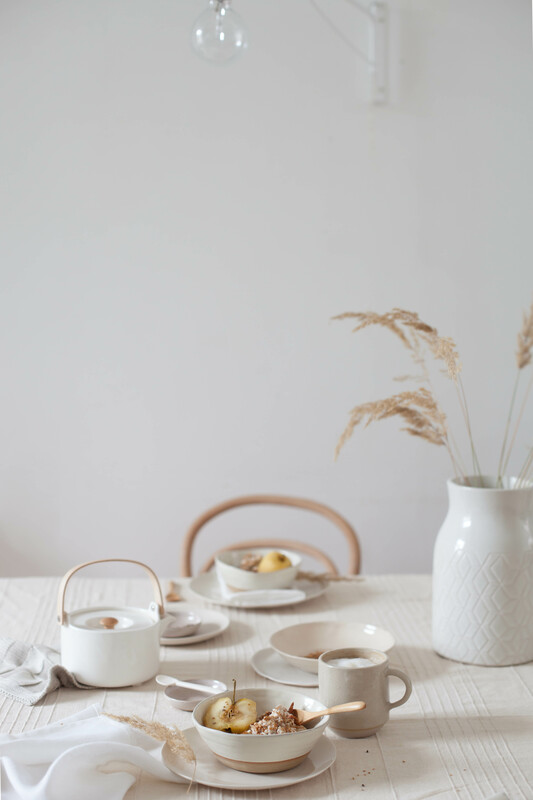 For this table, I played with a minimalistic colour palette, sticking to creamy tones alike to that of coconut, wheat and milk. 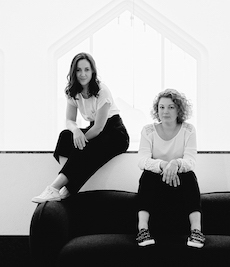 I bought that little teapot while in Hannover recently working with Holly Becker while prop shopping for her upcoming book at a local Marimekko boutique (we both bought the same one!). I use it all of the time when I am working behind my desk in the studio. 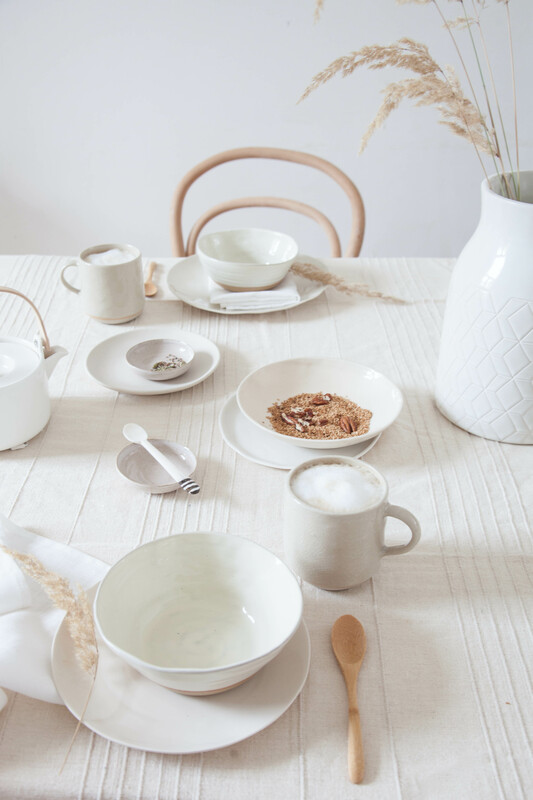 I also used gorgeous textured ceramic bowls I brought back in my hand luggage from my recent trip to South Africa (I tend to do things like that which my husband loves), pairing them with new ceramic plates from Dille en Kamille and mugs from a little local boutique I love and frequent often called Het Waarenhuis. So what is your morning ritual? Do you have a go-to, no-fail breakfast? 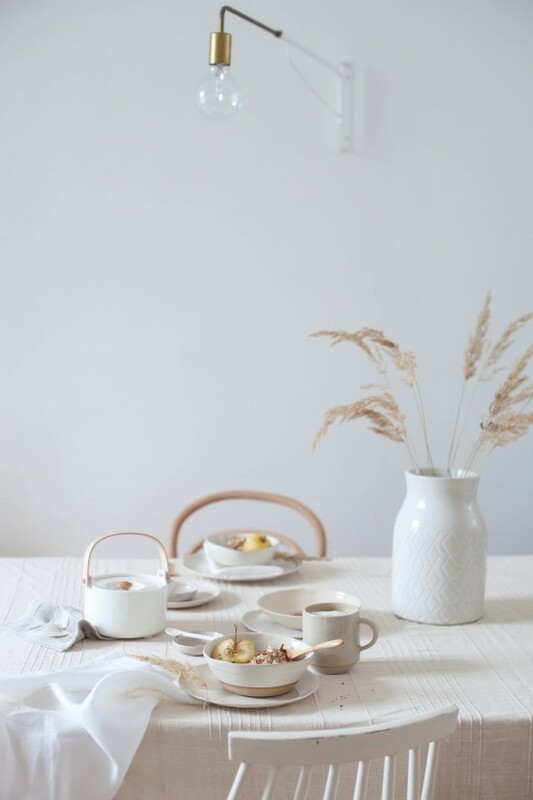 Beautifully arrange breakfast table. 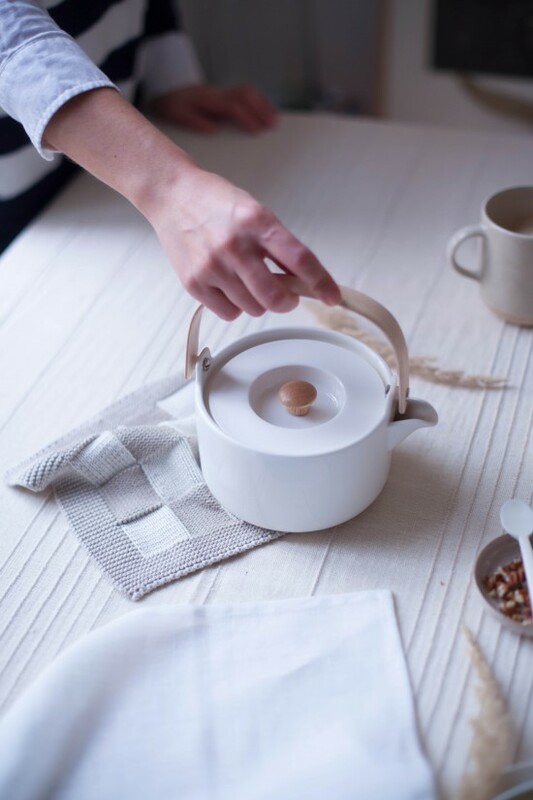 I like the color palette in this article, also like the ceramic bowl and the tea pot cause I am a tea lover. Thanks for sharing your breakfast ritual. 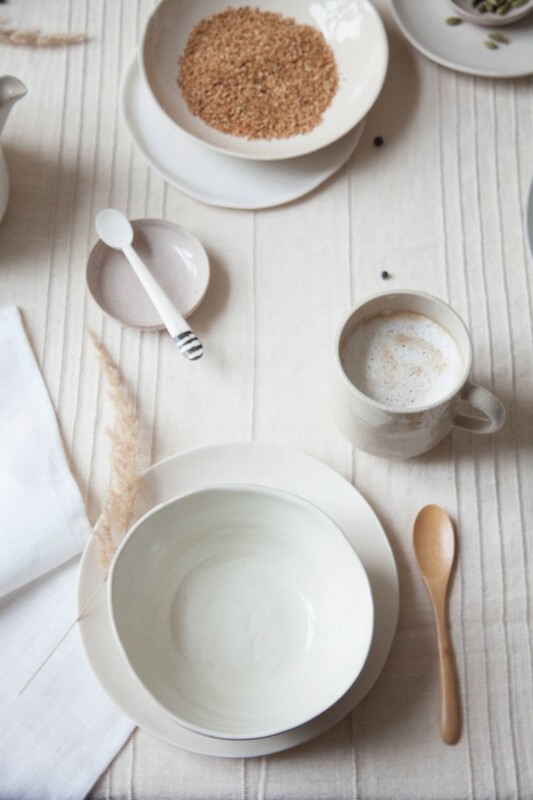 Love the imperfection of ceramic bowls. Absolutely gorgeous! 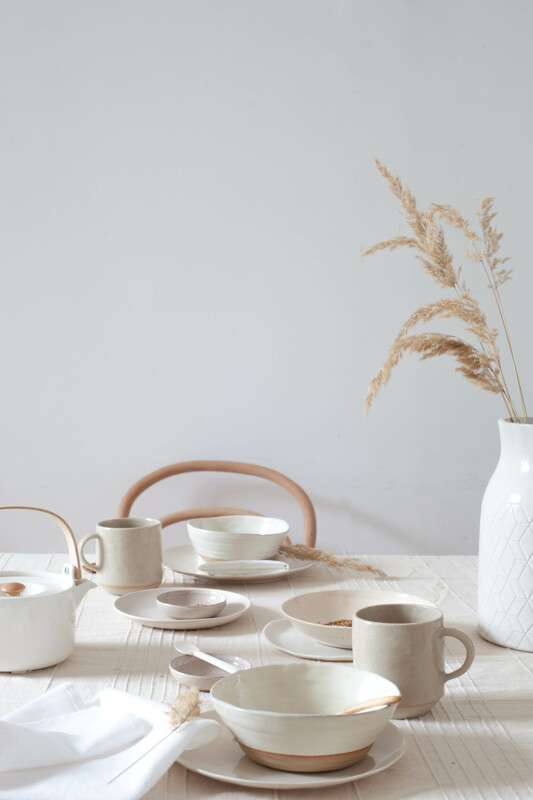 I love this colour palette, very neutral but still warm. I'm really into oats as well, especially in the winter months to keep warm and cosy.